I still love this book. I am trying to remember exactly how many times I've read it but I honestly don't know. This is one of the few series that I go back a read whenever I have a lull or just get bored with every thing that Im reading. This time around I did try to read my hard copy of the book instead of the audio CD and I just couldn't do it. I absolutely love the narration of this book! Bones' accent is amazing. It adds so much to the story to be able to hear all the different accents and the narrator does a brilliant job of changing her voice for each character. 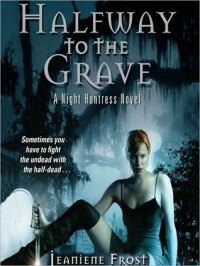 I was also reading [b:Outtakes From the Grave|25917147|Outtakes From the Grave (Night Huntress, #8)|Jeaniene Frost|https://d.gr-assets.com/books/1447282694s/25917147.jpg|45805924] along side of the book. So that was kind of interesting to add in the deleted scenes. I got the Outtakes book for Christmas and I couldn't decide how I wanted to read it.. If I wanted to just read it straight or if I wanted to read it along with the actual books. My sister read it with the books and said that it gave the book just a little something different. Which it did. I can basically read this book by heart now so so I enjoyed the deleted scenes. Jeaniene Frost is my favorite. Like I said, I always fall back on this series or Vlad's story whenever I need something to get me out of a reading funk.